You can’t have a website without a domain name. It's like a street address that tells people where you live, a domain helps customers drive directly to your website. Setting up a domain can be done in 3 easy steps -- Selecting the appropriate name for your business, searching for its availability and registering it before anyone else does! Back in the early decades of the 2000s getting a domain wasn't a difficult task except for the fact that it took a lot of money to register and re-register than it does now in 2018; Back then not a lot of people had access to the internet and the hype that is created today was just starting out, however, today the scenario has changed totally and chances of getting a domain name that's right for you have decreased as more and more users come up with the same names for their website. 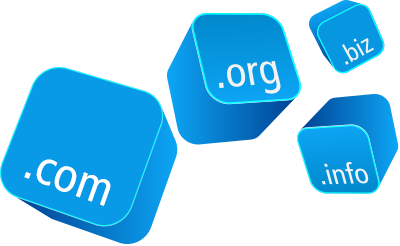 We strongly recommend you to choose your domain name carefully and read tips online on selecting it if necessary. Getting a domain means you are now going to be listed in the search engines online, it means that you can safeguard the identity of your business on the internet, it means basically means that customers drive directly into your shop and not through any shady online selling portal! We also provide excellent customer service before and after the purchase and installation of the domain.